No Kitchen Required debuts tonight on BBC America at 10 p.m. Eastern. No Kitchen Required may use similar elements to Chopped, Iron Chef, or any of the other cooking competition shows fighting for market share at the moment, but its non-cooking elements set it apart. This isn’t a show that anyone should watch for the recipes or the graceful choreography of modern cooking technology used to create molecular gastronomy dishes. It’s a subtly enlightening blend of travel show and cultural exchange, seasoned with survival sequences and physical challenges. Yes, once that’s done, we get to the usual timed cooking segment. The show is designed not only to feature the cooking talent of the three celebrity chefs, but also the locale and the traditional culture featured each week. If Man vs. Wild and Chopped were thrown in a blender with a bunch of National Geographics, it would look a lot like No Kitchen Required. 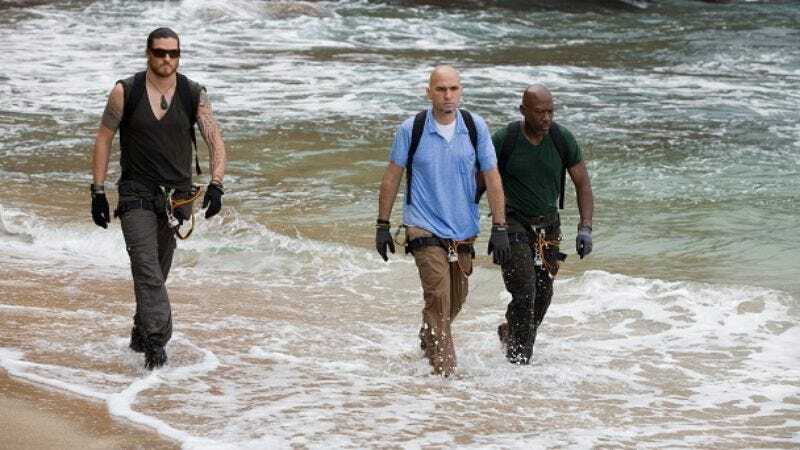 The pilot episode is shot in Dominica, a Caribbean island with a native population that emigrated from South America. The local cuisine heavily features seafood and root vegetables, and the country gets upward of 350 inches of rain a year. The three chefs featured come from various backgrounds of renown and previous experience on the televised cooking competition circuit. British chef Madison Cowan appeared on several different cooking competitions, Michael Psilakis owns a couple New York restaurants and has a Michelin star, and Kayne Raymond was a private chef to high clientele, including Larry Ellison, CEO of Oracle. The early scene when the chefs share a traditional meal with the elders and their guides reveals what the chefs see in the local food that they’d like to experiment with, and their conversations with the guides on how to get those ingredients shows how previous experience quickly turns to new culinary experiences for inspiration. Instead of prim and proper food judges, the cooking competition is at the mercy of the actual elders of the culture whose cuisine the chefs are learning about. The Kalinago cuisine is heavy on stews and soups, with lots of hot pepper and salt. In order to win, the chefs don’t necessarily have to create the most original or flashy dishes, but would do better to figure out what parts of the traditional cuisine are most highly valued, and present those same flavors in a unique way. The judges aren’t critics in search of the trailblazing new talent; they want a cultural exchange that properly preserves the integrity of the native cuisine. The best sequence by far shows each chef paired with a Kalinago guide while hunting, fishing, and foraging for ingredients. Even though in the cooking portion of the show many additional items are provided, the chefs struggle to spear, capture, and kill fish, crayfish, and opossum. Cowan’s fear of rodents proves hilarious, as he misses the first animal his guide shakes down from a tree, too afraid to get his hands dirty and kill. Kayne goes handfishing for crabs and crayfish, diving into a river to search under rocks, unable to see if he’ll get pinched. Michael gets a lesson in spearfishing in open water, and it’s clear all three chefs are humbled by the experience of performing the manual labor necessary to collect their ingredients. Foraging for spices and fruit complements the hunting, with all the sequences in the wild hitting much more compelling notes than any of the prepared moments or staged competition. The outdoor environment and hands-on approach could not be more different from the gleaming sets of Kitchen Stadium and other massive, fully-equipped kitchens. It’s a testament to the skill of the three chefs that they can turn everything foraged and hunted into dishes that would not look out of place in a Caribbean resort restaurant. No Kitchen Required still has the usual cooking competition stumbling blocks: stilted, stuffy ADR over cobbled B-roll footage explaining the rules, as well as a brief, unnecessary challenge to start the episode that takes the place of more intermingling between cultures. There are other strained moments: The chefs are introduced as they rappel down a rock face onto a beach where host Dr. Shini Somara waits to deliver hastily written introductions, Cowan stumbles through a talk with his young hunting guide about the importance of education, and once the competition is settled, the chefs give the judges books for the children, who walk in wearing modern clothing that clashes with the “traditional” garb worn by the leaders. There are also awkward moments where the strain of purposeful “giving back” sentiment overtakes what could be a much more natural feel, and at times, it’s strange to think what will happen once the cameras go away and move onto another culture for broadcast back to the foodie audience. But in the cacophony of cooking shows that feel like different facets of the same stone, No Kitchen Required finds a blend of previous reality competition and cultural documentary that feels fresh. Despite my enjoyment, I couldn’t help but wonder why no the roster has three male chefs. The chefs have very different temperaments, but I think having a female competitor would vary the styles even more. The episode touts Raymond as a private executive chef, but only the BBC America website lists the CEO of Oracle among his clients without listing Larry Ellison’s name. Perhaps he’s now trying to keep a lower profile than his son and daughter.